Liposuction has become one of the most popular elective surgeries performed today both around the world and among our own patients in the Chicago Metropolitan area. With the ability to reduce fat cells from troubled areas such as the abdomen, hips, and thighs, people choose liposuction to help them achieve the body of their dreams. Liposuction is more than simply reducing unwanted fat. It can be used to improve chin and necklines, and slim areas such as the knees, upper arms, and the back. For people who have tried dieting only to find they are still dealing with unwanted pockets of fat, lipo can provide the slim shape that nature has been withholding *. Liposuction is the reduction of unwanted subcutaneous fat cells from the body. In other words, the fat that exists just below the skin. We all carry fat throughout our body, including around our organs, but most people associate unwanted fat with the fat that is right below the skin – the areas you can pinch. Liposuction targets this unwanted fat by suctioning it out of the body via a small incision and a cannula (a hollow stainless steel tube). The most common area to have liposuction performed for both men and women is in the abdominal region. However, almost any part of the body that carries unwanted distribution of fat cells can be targeted. It’s even used for breast reductions in some women. There are several methods of liposuction from which to choose. They include traditional liposuction (including the “wet method), laser, ultrasonic Vaser) and the newest and most advanced technology, Waterlipo™which utilizes the Body Jet System. Traditional liposuction is generally expensive because of the need for hospital care and general anesthesia and has higher complication rates than the newer technologies. Ultrasonic lipo is effective but has resulted in complications such as burns which make it less desirable. Laser assisted lipo is a great technology but is somewhat limited in the amount of fat that it can reduce when used by itself. Waterlipo™ is one the safest technology currently available and is so gentle that hospitals and general anesthesia are not required *. Significant areas of fat can be extracted while the patient is awake with local tumescent anesthesia. This procedure is done in the office and most patients can return to normal activities the next day *. Dr. Rosett is an expert in laser liposuction and is the doctor who trademarked Waterlipo™. During your consultation, he will help you determine which technology or technologies best serves your needs. However, in 1985, dermatologist Dr. Jeffrey Klein invented what has become known as the Tumescent Technique. This method of liposuction allows the selective numbing of large areas of subcutaneous fat by local anesthesia. The technique uses a special formula of sterile dilute salt water, adrenaline, lidocaine, and bicarbonate to enlarge fatty tissues for easier penetration of the suctioning wand (cannula). This reduces trauma to the area and the solution reduces pain, bleeding, and complications. Using the tumescent technique, liposuction had its first major revolution in that it could then be done in the office under local anesthesia and was incredibly safe. In fact, a recent study of 15,000 cases using the tumescent technique showed no major complications. Dr. Rosett, who learned tumescent liposuction from the pioneers, uses tumescent anesthesia in all cases. General anesthesia is NEVER used and all procedures are done in the office. Moreover, Dr. Rosett is part of the new generation of liposuction surgeons who is creating a new revolution. He is a national instructor of liposuction and has trademarked what many experts call the greatest advancement since the tumescent technique, Waterlipo™. Waterlipo™ is the newest technology in minimally invasive fat extraction. It is done in the office without general anesthesia or IVs. Waterlipo™ uses a gentle stream of water to dislodge fat that is then gently washed out of the body. To learn more about Waterlipo™, e-mail us or call 847-807-4096 today. Until recently, Laser liposuction was the latest advance in body contouring, fat extraction, and skin tightening. Laser lipo machines have been produced by many companies including Cynosure with the popular SmartLipo™ system and Sciton Aesthetic Laser Company. In fact, the sheer number of lasers on the market creates a tremendous amount of confusion for the typical person. The truth is that there is, in fact, very little difference between most of these lasers when you look at them only by their company name. Dr. Rosett looks not at the name of the company when deciding what lasers to use for laser liposuction but rather the specific wavelengths that are emitted by those lasers. After all, the wavelengths are what help with the procedure, not the company name. Currently, most liposuction surgeons agree that it is critical for at least two different wavelengths to be used during laser surgery—the 1064 wavelength that is primarily for melting fat and the 1319 or 1320 wavelength which is used to tighten skin. When these wavelengths are blended, you will get the most out of laser liposuction. Otherwise, your procedure will not be optimized. 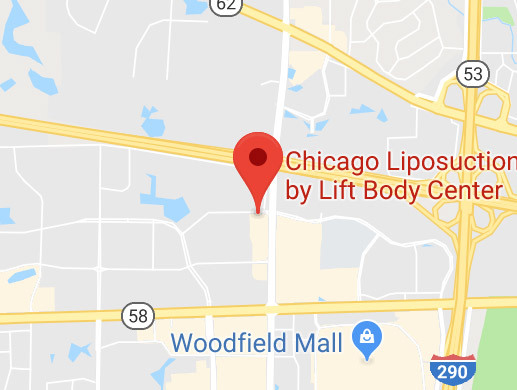 Dr. Rosett, the founder of the Chicago Liposuction by Lift Body Center, decided early in his career to focus his practice on cutting-edge cosmetic techniques after he learned the tumescent technique from Dr. Jeffrey Klein, the inventor of the Tumescent technique. Rosett’s objective was to provide the safest, most contemporary, and minimally invasive cosmetic procedures. As an early adapter of liposculpture techniques, instruments, and applications, naturally, Dr. Rosett was at the forefront of laser technology. In fact, he now teaches physicians from around the world in laser lipo techniques. Dr. Rosett is a believer in liposuction and uses it in his procedures. However, he found laser liposuction alone to be somewhat limiting in the amount of fat that can be extracted. This kind of liposuction is good at extracting small amounts of fat (such as in the neck) but is better at tightening skin. However, he wanted to be able to help more patients get even better results by extracting more fat and by doing it in an even more gentle way. Until Waterlipo™, all other kinds of lipo relied on the concept of crushing or melting fat and then sucking it away—both still somewhat traumatic. Waterlipo™, on the other hand, uses a gentle stream of water to literally dislodge fat that is then gently washed out of the body *.